Care packages are continuing to be sent out at the beginning of each month. We were able to send some Halloween themed boxes in October and sent out Thanksgiving themed boxes this week. I have continued to get some nice donations that I have been able to include in our shipments. 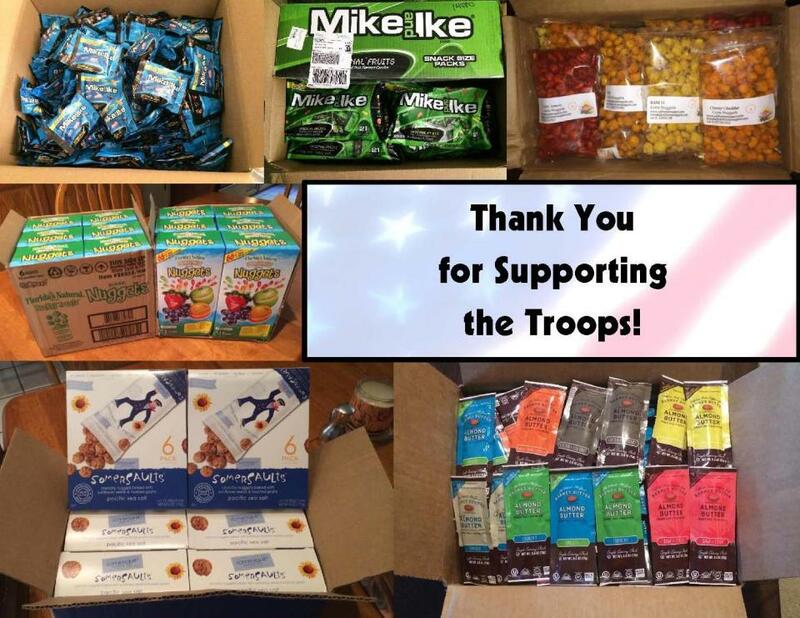 Thank you to the following companies: Just Born Candy Company (2 cases of Mike & Ike’s Candy), California Nuggets (1 case of flavored corn nuts), Somersaults Snack Company (1 case of sunflower seed snacks), Barney Butter Company (1 case of Almond Butter Packets), Au’some Inc. (2 cases of Florida’s Natural Fruit Nuggets). NOTE: Please, no pork products, aerosols, liquid hand santizers (wipes are OK), glass containers, or expired products. Thank you for your continued support of our platoon. Previous post: Thank You From Our Adopted Platoon!